Learn how to create a custom mobile app using WordPress, the WP REST API, ionic, and PhoneGap. If you've ever been curious about what it takes to make a native mobile app using the same tooling available to you as a web developer, this is the perfect introduction. Each of our sessions are digitally broadcast live and feature world-class and well-known speakers. Each presentation typically has 30-40 minutes set aside for instruction followed by another 15 minutes or so for Questions & Answers at the end. 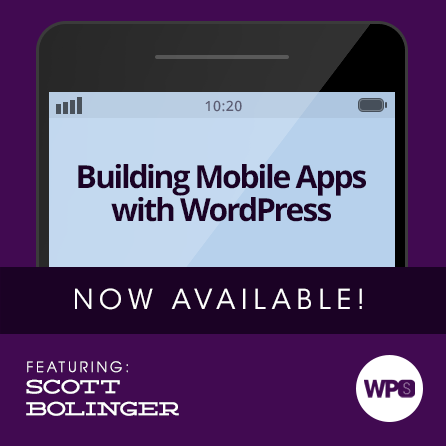 This month we are joined by Scott Bolinger of AppPresser.com to learn how we can create our own mobile apps using WordPress. Scott has been doing this himself for quite some time now and I do not believe there is a better person on the planet to speak on this process. We’ll learn how to use the budding WP-API to make it easy to get data in and out of our WordPress site, how to build a lean front-end using AngularJS, and how to compile the whole site into a mobile application package that is ready to distribute via the various app stores. You can attend this session having never used the WP REST API or any of the other technologies we’ll be discussing. No matter what, by the time the session is over you should have enough working knowledge to build a working mobile application using WordPress. All code used during this session will be available to review and download via GitHub. Scott is the co-founder of AppPresser which allows you to build iOS and Android apps with WordPress. He recently launched a new SaaS product called Reactor in December, follow his journey from trials to triumphs with real numbers on his blog.